In the presidential election of 1876, two governors, Republican Rutherford B. Hayes of Ohio, and Democrat Samuel J. Tilden of New York, opposed each other. In his acceptance of the nomination, Hayes wrote that if elected, he would bring “the blessings of honest and capable local self government” to the South–a signal that he would ease federal enforcement of unpopular Reconstruction-era policies which had been imposed by the Radical Republicans following the end of the Civil War. The Democrats hoped to exploit voter concerns over the economic depression with falling crop prices and high unemployment which followed the Panic of 1873 and the corruption scandals in the Grant administration which had tainted the reputation of the Republicans. By midnight on Election Day, Tilden had 184 of the 185 electoral votes needed after winning the swing states of Connecticut, Indiana, New Jersey, and New York. He held a small lead in the popular vote by 250,000, but the Republicans refused to concede the election. They accused the Democrats of using physical intimidation and bribery to prevent or discourage African Americans from voting in the southern states of Florida, Louisiana and South Carolina. Oregon also was in dispute: its Democratic governor had replaced a Republican elector with a Democrat on the ground that the Republican, a postmaster, was a federal employee and thus ineligible to serve as an elector, an action which was challenged when the Republican elector resigned his job and claimed the right to cast his ballot for Hayes. Democrats, in turn, accused Republicans of ignoring many Tilden votes. In Florida, the Republicans claimed to have won by 922 votes out of about 47,000 cast. The Democrats claimed a 94 vote victory. Democrats charged that Republicans had ruined ballots in one pro-Tilden Florida precinct by smearing them with ink. When electors met in state capitals to vote for president on December 6, 1876, both Republican and Democratic electors met in Florida, Louisiana, South Carolina, and Oregon, and cast conflicting votes, with the four states each submitting two sets of electoral returns to Congress with different results. 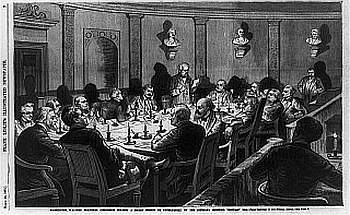 To resolve the dispute, in January 1877 Congress established through legislation an electoral commission made up of five U.S. representatives, five senators, and five Supreme Court justices. The justices included two Democrats, two Republicans, and Justice David Davis, who was considered to be independent. But before the commission could render a decision, Democrats in the Illinois legislature, under pressure from a nephew of Samuel Tilden, elected Davis to the U.S. Senate, in hopes that this would encourage Davis to support the Democrat. Instead, Davis recused himself and was replaced by Justice Joseph Bradley, a Republican who was nonetheless considered as not rigidly partisan. During the commission’s deliberations, Republicans met in secret with moderate southern Democrats in hopes of convincing them not to block the official counting of votes through a filibuster and effectively allow the election of Hayes. In February, at a meeting held in Washington’s Wormley Hotel, the Democrats agreed to accept a Hayes victory, and to respect the civil and political rights of African Americans, on the condition that Republicans withdraw all federal troops from South, thus consolidating Democratic control in the region. Hayes also agreed to name a leading southerner to his cabinet and to support federal aid for the Texas and Pacific Railroad, a planned transcontinental line which would follow a southern route. On March 2, the commission voted 8-7 along party lines, with Justice Bradley voting with his fellow Republicans, to award all the disputed electoral votes to Hayes, thus giving him 185 votes to Tilden’s 184. The partisan result, accompanied by rumors and insinuations over side deals and influence peddling, provoked resentment to the point that some felt there was a risk of armed violence. After Hayes took office, he followed through in withdrawing the federal troops from the South. The Republican governments in Florida, Louisiana, and South Carolina collapsed, bringing Reconstruction to a formal end and the eventual imposition throughout the South of racial segregation and the disfranchisement of black voters. Southern blacks were forced to make their living working the land under the sharecropping system, which offered little opportunity for economic advancement. 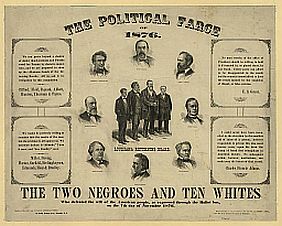 Politically, the Compromise of 1877 also led to the Democratic Party supplanting the Republicans in control of the state governments and Congressional representation of the southern states. Democratic dominance in the Congress, along with the power of seniority as long-serving southerners ascended to key leadership positions, also served to block civil rights measures for well into the next century. The controversy over the election of Hayes continued to impact his presidency, with his critics deriding him as "Rutherfraud Hayes" and addressing him as "Your Fraudulency." But he did attempt to address growing concern over political corruption, supporting civil service reform which was later enacted in the Pendleton Act of 1883. and he saw to the enforcement of the Resumption of Specie Act, which placed the United States back on the gold standard. His pragmatic, measured response to the Great Railroad Strike of 1877—remaining neutral between strikers and management, and only allowing the limited use of federal troops to keep the peace when state or local officials requested assistance—probably saved lives and property. By the end of his term, economic prosperity had returned. A supporter of a single-term presidency, he declined to run for reelection. 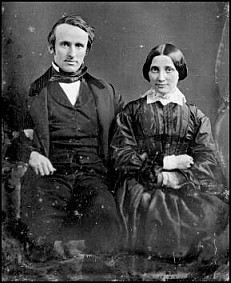 * Fraud of the Century: Rutherford B. Hayes, Samuel Tilden, and the Stolen Election of 1876 by Roy Morris, Jr.